Sales acceleration tools backed with accurate data can help your teams speed up the purchasing process for customers. In order to move a prospect to a paying customer quickly, sales and marketing teams must be working in unison. With all of the new technology and the mountains of data available for B2B sales and marketing teams to use to fuel their campaigns, it’s a bit alarming that we’re still discussing sales and marketing misalignment in 2018. It’s clear that technology alone is not solving the problems these teams face. In fact, a recent study on the State of Sales Acceleration revealed that B2B sales and marketing teams continue to struggle to reach the right audiences, convert leads and prove return-on-investment (ROI). According to the salespeople surveyed, the average salesperson spends over two hours looking into each prospect before contacting them, leaving little time to actually reach out to new prospects and sell. Consequently, nearly a quarter of salespeople said they don’t have enough time to research potential customers. Marketers face their own frustrations while working alongside sales teams, saying their three biggest challenges involve understanding who their exact target audience is, ensuring they have complete and relevant data and measuring the success of their campaigns. While the data shows a clear issue, 76% of sales people said they are confident in the quality of leads passed over from marketing. This begs the question, are sales and marketing departments openly discussing the challenges with the data at hand, or are sales teams just happy to be getting a steady stream of leads to add to their pipeline, regardless of accuracy and completeness? The survey shows that there’s no doubt sales professionals understand the importance of having accurate and complete data; 93% agree it’s important to have when looking to reach out to targeted accounts. But based on some of the challenges noted, it may be that many sales teams are in the dark when it comes to knowing if that data is actually accurate and complete. It’s not just the sales and marketing teams who are frustrated by the disconnect. Only half (51%) of buyers said they have seen an improvement in sales and marketing communications over the last few years, despite the proliferation of tools and analytics designed to target B2B buyers. Nearly half (48%) of surveyed buyers still believe the communications they receive are not at all relevant to their role, indicating a need for sellers to connect offline and online customer data, offer more relevant communications and accelerate the buying journey. It’s clear what buyers want – more relevant and targeted messages, delivered at the right time, and marketing organisations know this. 92% of marketers participating in the study said they recognise the need to deliver personalised and targeted communications to be more effective. But for that to happen, they need to be working with, and openly sharing, accurate customer data between departments and within platforms. Despite the continued disconnect between the teams, there is hope on the horizon. There are things teams can do in order to have a more holistic view of the customer and offer a more united customer experience, thereby driving that customer through the sales funnel more quickly. 1. 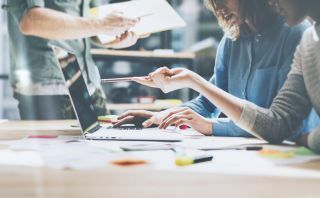 Shared Goals – Before purchasing one piece of technology or running one single campaign, it’s imperative that sales and marketing teams have shared goals and processes. While many marketing teams still measure success based on pipeline, that doesn’t pay the bills. Having shared revenue goals aligns sales and marketing teams around a common vision that allows them to focus their efforts on only the best prospects and customers that will quickly convert to realise those revenue goals. 2. Data – An overwhelming majority (92%) of sales and marketers surveyed say they recognise the importance of having the right data to understand each prospect's needs, but they aren’t seeing the results they had hoped. As sales and marketing teams converge, it’s critical for them to have accurate and aligned data about their target audiences to help convert any lead into a paying customer more quickly. It’s vital to have data that is organised, structured and integrated across the enterprise. In other words, the data must be mastered so the information driving key business decisions is accurate and fresh. Ideally, the data should also be a combination of first-party data and a trusted third-party data source. First-party data can include information collected from a website, through support systems, or via a CRM platform, for example. Third-party data can then be used to enrich and complete your first-party data. This structured data is the foundation for engaging prospects with the right context. The next step is to tie together all customer activities with a unique identifier so you can capture every interaction a customer has with your company. In a B2B environment, this is especially important so you can connect an individual to the company or account for which they are doing business. That information allows you to build a robust and unique customer experience, which today’s buyer has come to expect. 3. Driving insights – Once the data is structured and integrated, teams can drive insights pulled from this vast ocean of data; this is where analytics are vital. A company can tie all of these unique data points together and use the insights to set off a trigger for the sales person to call at that exact right moment with the exact right context to take the sale to the next level. Cloud-based technologies have made this type of instant analysis a reality for many organisations; the cloud keeps your data updated in near real-time and allows for much more intelligent prospecting. 4. Operationalise – Feeding the data and analytics into existing systems and frameworks helps sales and marketing teams by seamlessly supplying the right data and insights into their daily work routine (such as their CRM), so they can easily act on that information through use of things like trigger alerts. It’s important to deliver the information when and where people want to access it so that it easily becomes a part of the daily flow of activity and, more importantly, so everyone is working from the same dataset. Ultimately, it’s about being much more prescriptive in highlighting opportunities, stressing what’s changed, identifying the accounts that should be prioritised, and providing insights on how to engage with each account. B2B buying is a long process that is likely to begin before a salesperson is even involved. Anything a sales or marketing team can do to accelerate the process will impact the bottom line. By more closely aligning around goals, data and insights and by employing sales acceleration tools that incorporate real-time, accurate data with buying signals, marketing and sales teams will have access to more relevant information that’s connected, insightful and actionable, which helps convert prospects into customers and increases ROI.